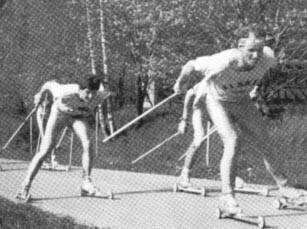 Rollerskis was born as Summer training technique for country skier. 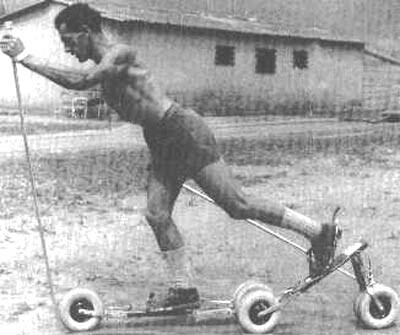 First rollerskis were built in the mid ‘30s in Italy and North Europe. 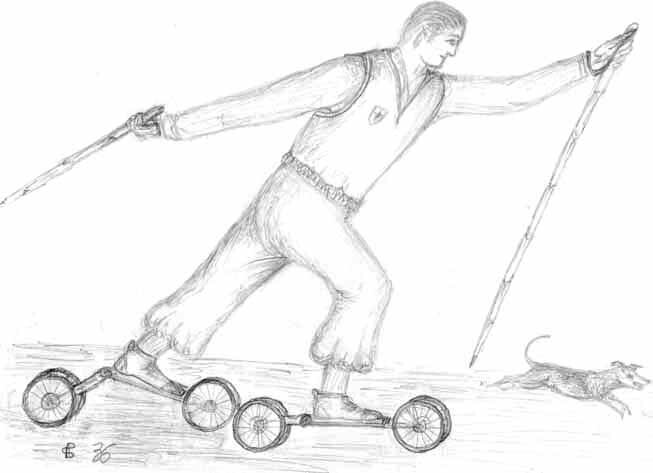 Fig.1 – The rollerskis shown had 4 wheels with a diameter of about 15-20 cm. From the drawing it is not clear the kind of no-return device used. It could have been a bicycle free-wheel, used in recent times, or a breaking system coming into action when the folding bar was lifted up. The first competitions, held in Asiago and Sandrigo (North of Italy), were quite successful, both from participants and public point of view: for the first time country ski could be enjoyed in town. 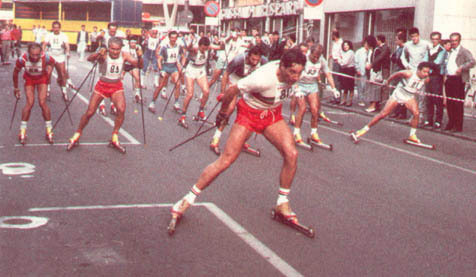 At the beginning rollerskis were just for few: quite popular in Scandinavia, only top athletes of the national team were using them in Italy. 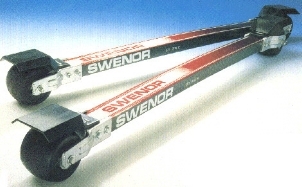 Rollerskis were originally manufactured in Sweden, then in Germany. 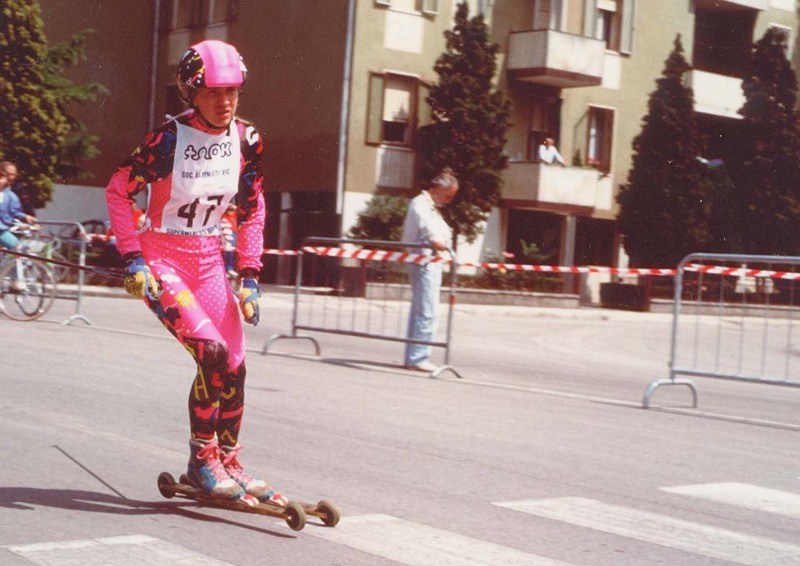 The first rollerskis made in Italy came from Sandrigo (near Vicenza) thanks to the initiative of Fabio Crestani a craftsman interested in specific equipment for tennis grounds, and manufacturer of grass skis. The first model was called ski skett, it had three pneumatic wheels with a diameter of 35 cm, one in the front and two in the back, slightly tilted in order to widen the support base. The iron frame was equipped with a kind of break: a lever pushing between the back wheels. It was very heavy and not very easy to use. 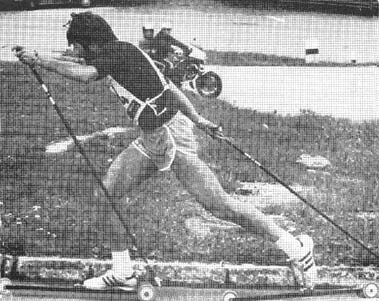 However, this was the starting point for a continuous research that, with the contribution of athletes, brought skirollers to a high level of sophisticated mechanics. The iron frame was then replaced by a slightly lighter and longer one with a hinge in the middle for more extended strides, leaving the wheels (and therefore most of the weight of the skiroll) on the ground. 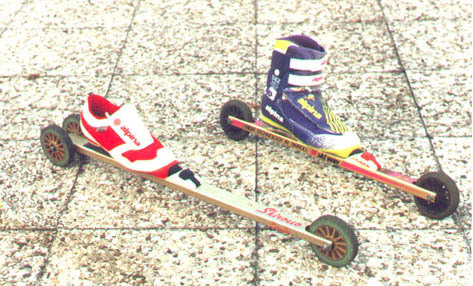 The second generation of rollerskis called ski skett F still had pneumatic wheels with a diameter of 18 cm. This model was then improved. An additional spring was introduced on the hinge to help the athlete stretch the leg backwards while lifting the frame. 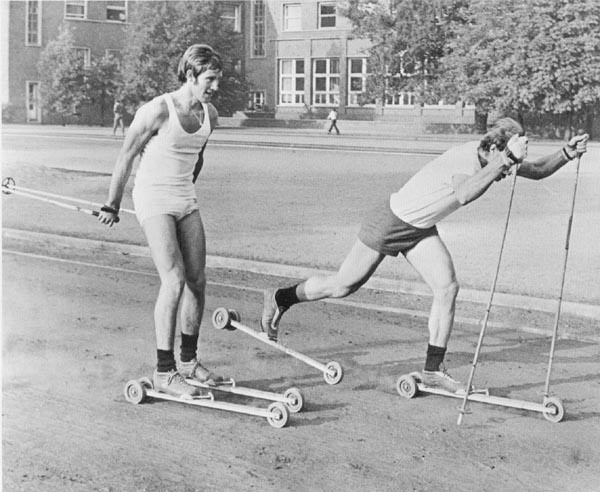 In 1975, rollerskis had become very popular. Athletes felt they could start to engage themselves in competitions. 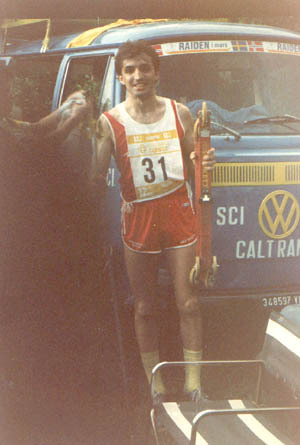 In 1976, Giustino Del Vecchio, an air pilot, established a record in Monza by doing 240.5 km in 24 hours thanks to the skirolls he had designed, using material and technologies from the aircraft industry: narrow solid wheels with hard tread, reverse lock-up ball bearings to enable push forward. From this moment on, numerous improvements were introduced: the original iron frame was replaced by aluminum, super light alloys, and then by fiberglass. The length was reduced from 90 to 70 cm. 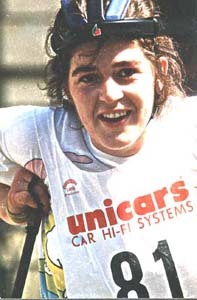 The diameter of wheels changed from 80 to 125 mm, with rubber or polyurethene tread, smoother and smoother ball-bearings to the point that manufacturers (Crestani together with Dameno from Milan and Miorin from Mestre) were forced to differentiate models since rollerskis designed for competitions were far too fast for training. Specific skirolls for training were then designed: two wheels, soft tread more suitable to absorb vibrations produced on rough pavement. 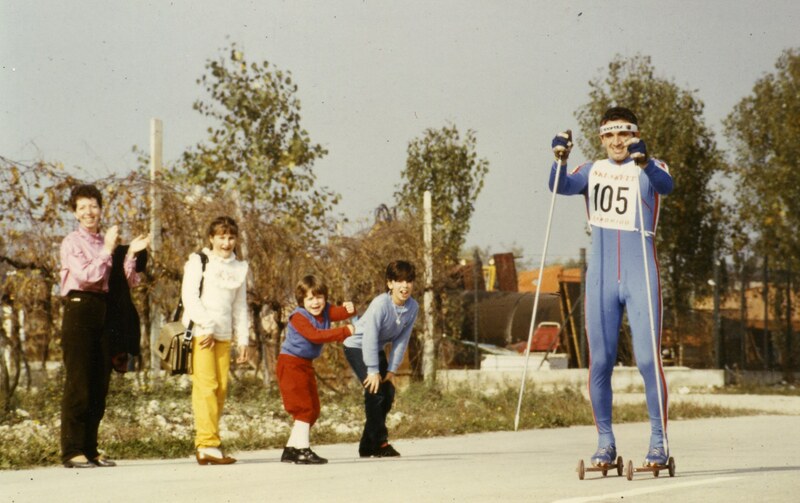 In 1979, in Italy, a group of fans founded the Italian Association of Rollerskis (AISR, Associazione Italiana Skiroll) . 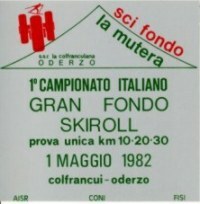 In 1988, AISR was renamed FISR (Federazione Italiana Skiroll), with the objective to promote, and rule the rollerski practice both for competition and for entertainment. Today rollerskis is considered – not just as a complementary practice to country ski – but a discipline with its own regulations and competitions held when country skying cannot be practiced. Skirolonga del Montello in the Montello is a race that for three years, since 1988, replaced the Skirolonga. 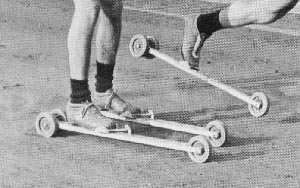 Rollerskis used, were made of 2 single bars 70 cm long, usually in light alloy (some models were also built in fiberglass) on which one front wheel and two rear wheels (dia 80 – 100 mm) were mounted. Wheels were made in rubber or plastic material, they were equipped with a reverse lock-ups (could not go backwards). In some models the front wheels were free turning. Fig. 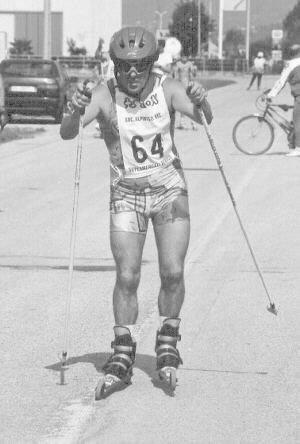 4 – Maurilio De Zolt, doing classic style with 3-wheeled rollerskis during the 1987 uphill race in Lentiai (Belluno), that he often won. Fig. 6 – In the kicking phase the applied force of the arms is exploited by the same poles used in country skiing while a firm grip is guaranteed by the appropriate high resistant steel ferrules (widia). A) Steel toe not suitable for tarmac. B) widia toe, suitable for tarmac. In the three-wheel rollerskis designed for classic style the reverse lock-up device prevented wheels to turn backwards during the kicking phase. 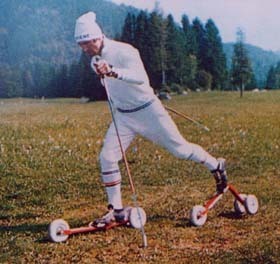 The introduction of skating in country skiing implied some changes in the use of materials and training methods; which consequently produced an impact on rollerskis (maybe changes were started by rollerskis, with which skating is much easier). 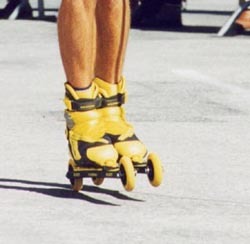 From 3 to 2 wheels, much lighter and easier to use, rollerskis could be used both for the classic style and skating. 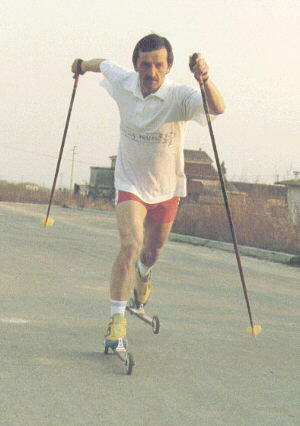 Paolo Miorin, with his famous Skirollo, can be considered the inventor of the innovative 2-wheels rollerskis. For some years, speed races have been organized by G.S. 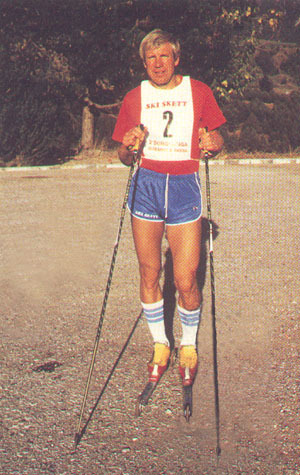 Ski Skett during the month of November first in Bassano del Grappa, then in Sandrigo. The results of these speed races can be seen in the Record Day results. Some of the powerful athletes of this transition period were Efrem Bussolaro, Guido Masiero and Silvano Berlanda still practicing at top level, among women Monica and Sara Rigoni from C.S. Bassano and Elisa Pavan of C.S. Pettinelli. 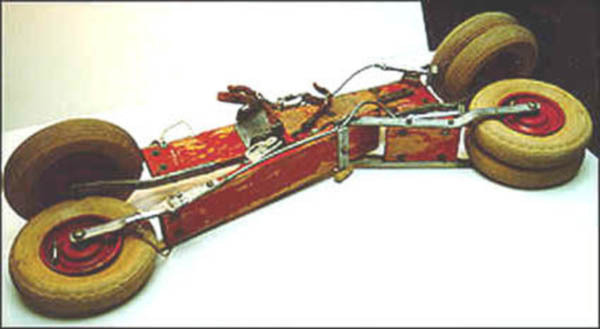 Three-wheel rollerskis, suitable for the classic style, were heavy and bulky. 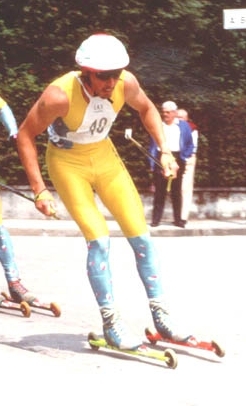 Thanks to the new technologies introduced by country skiing, rollerskis became a light, easy-to-use 2-wheel skate, suitable both for classic and skating style and all its variations. Fig. 13 – Shoes have also changed, since they must be higher and stiffer on the side to permit a better stability. 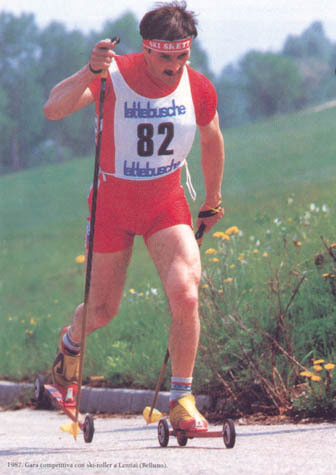 Skirolls are equipped with standard locking and cross country ski shoes. 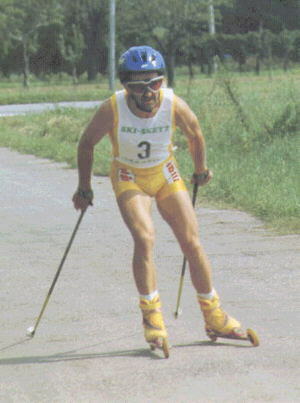 International rules fixed the minimum length of rollerskis to 53 cm (from axis to axis). To improve ease of use the length of rollerskis was reduced. Today, many athletes like to remove the reverse lock-ups (ratchet) that take up part of the energy produced during the pushing phase. 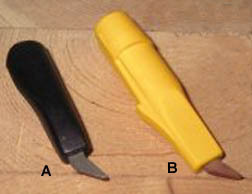 In this situation, the only possible style is skating, since classic style requires the lock-up (ratchet) on the wheel in the pushing phase. Today, international competitions are ruled by the Internationl Ski Federation, in Italy, national competitions are ruled by Federazione Italiana di Hockey e Pattinaggio (F.I.H.P.). Average speed on flat ground races is in the area of 33 km/h, with peak reaching 50 km/h. 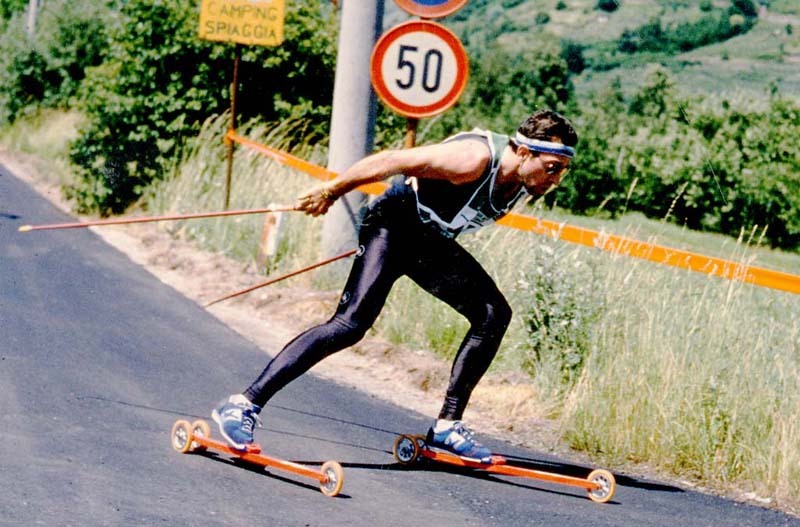 Compared to today’s roller blades used by skaters, rollerskis are slower on flat grounds or on moderate downhill, but are faster uphill thanks to the use of poles and arms push.